Dell Mobiele Breedband Adapter laptoponderdeel kopen? | That's IT! Nieuw in originele Dell verpakking inclusief stickers voor uw Dell-notebook, bevestigingsschroefje en korte handleiding. 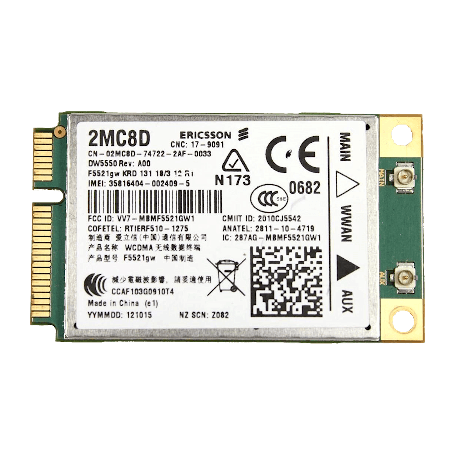 Stay connected while on the go with the Wireless 5550 3G/HSDPA Mobile Broadband Card from Dell. It helps maximize your productivity while maintaining contact with clients, colleagues and family. Its high efficiency compact broadband design provides consistent throughput performance. Its GPS capability allows you to retrieve location data from GPS satellites, utilize GPS navigation and location-based applications. This product has been tested and validated on Dell systems. It is supported by Dell Technical Support when used with a Dell system.